Samsung’s “phamous phablet,” the 5.3-inch Galaxy Note, continues to improve thanks to an update to Android 4.0 for device owners on AT&T’s network. The carrier is now pushing out the Ice Cream Sandwich software, which also includes Samsung’s Premium Suite of tools to enhance the phone’s digital pen. And as rumored before, it’s looking very likely that T-Mobile will soon announce availability of the Galaxy Note on its network as well. AT&T(s t) says the free update is available through Samsung’s Kies application, which is supported on both Windows(s msft) and Mac(s aapl) computers. The software won’t be made available as an over-the-air update. 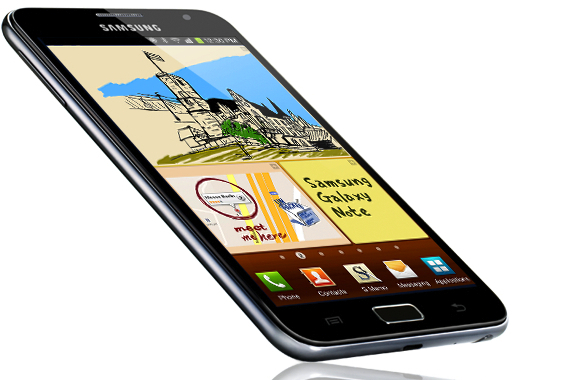 Along with the more refined Android 4.0 software, Samsung added three enhancements for the Galaxy Note’s S-Pen: Formula Match, Shape Match and a Knowledge Search feature that translates handwriting into a Wolfram Alpha search. While the Note has sold well on AT&T and overseas — Samsung says sales topped 7 million on June 1 — T-Mobile customers have been waiting to see if a compatible Galaxy Note would be made. Various leaks suggested yes, but a dead giveaway was found by the TMoNews site on Tuesday: A listing of Galaxy Note support documents on the official T-Mobile site. Since T-Mobile’s HSPA+ network uses the 1700 MHz band, a T-Mobile Galaxy Note will surely support that frequency, but I’m curious to see if radio support for AT&T’s HSPA+ network is included as well. Think of it this way: The more dependent we are on our mobile devices, the more we use them and therefore, the less we carry them in a pocket. That may sound far-fetched, but only if you consider it in light of today’s usage patterns; not those of the future. For a while, I used a 7-inch tablet as my primary device: I left the phone behind and used the tablet for VoIP calls, either on speakerphone or with a Bluetooth headset. And we’re using our devices for far more than voice calls these days. Perhaps the Galaxy Note will be remembered not as a “phablet”, but as the phone that started a movement toward the crowning of the tablet as the primary mobile device. Samsung Galaxy Note 2 (http://harryminhas.wordpress.com/2012/07/02/samsung-galaxy-note-2/) will feature 5.5-inch screen and will be launched this fall to compete against Apple’s iPhone 5 (http://harryminhas.wordpress.com/2011/02/10/iphone-5/). .